No, they aren't the same colorway, similar but not the same. Still, these are colors I like, so I bought them both. I really need a small project that I can pick up and set down easily. Something light and easy to take with me. Whatever happened to my Lucy Neatby Chequerboard Socks? Well, they are on a long term hold at the moment. They need to be fixed and that would require more brain power than I have to spare these days. Until I get back to those however, these will keep my sock needles from getting rusty. 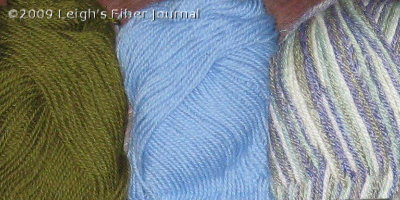 Another sucker for sock yarn here too. Considering I am slow with my sock knitting, it gets to stay around for a while too! The colors look lovely. I think it will be a lovely pair of socks! I think we all are, will if we are knitters that is! I always have a pair of socks going just because they are easy to take anywhere! Socks are indeed very easy to take along, and nothing beats handknitted socks in winter. It looks like you are going to knit many pairs! 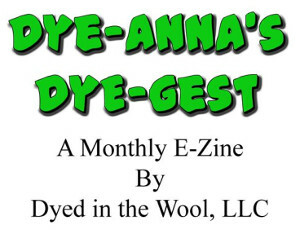 Another sucker for sock yarn.... Being able to buy one/skein ball of delightful yarn (occasionally it has to be 2 balls) is a relatively inexpensive way of satisfying by knitting fiber lust. And i knit socks all the time and have far more socks than I need. It's all those wonderful colour combinations! I have a stash of sock yarn and it keeps growing. Some for socks, some for weaving, some to knit jolly little stripey jerseys for my nephew (that takes a couple of 100g balls). Can you recommend a good book to guide a rank novice through making their own socks? Since I keep wearing out socks, it's about time I learn to make some. And you're the mostest fantastic knitter I know. Maybe, someday, I can be like Leigh! I must fess up to being a sock knitting fool too! There is just something so enticing about all the new sock wool out there and the prospect of wearing hand knitted socks. I've just started knitting my socks "toe up" and love them.....now I've got to find out if there is such a thing as "finger up" mittens? I like how you make "long term hold" sound so official. I feel like some of my projects are adrift...but actually, maybe I'll borrow that term and say they're in "long term hold!" I came by again, and saw the sock yarn again, and it's reminded me to turn the computer off and go and see if I can make my sock yarn stash a bit smaller!! Bye for now! I agree when you are tired and very busy it is really good to have little projects that don't take to much brain power! I am spindle spinning and knitting a scarf form kid mohair and and silk which I am really enjoying and have ten minutes here and half an hour there. 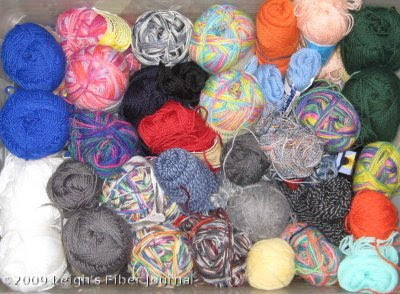 Your sock yarn colours look great and your collection made me smile-us textile people can't resist collecting can we? 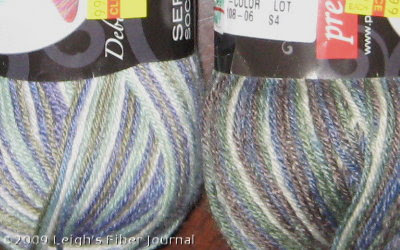 I try to not buy sock yarn because that's all I knit when I have sock yarn. I've recently succumbed four times. I'm doomed. How about a modular knitting project for you socky bits?